It’s not every day BCEC Director Professor Alan Duncan is asked to discuss his research on child poverty in Western Australia with an 11-year-old. But then Christopher Henderson is not your average Year 6 student. 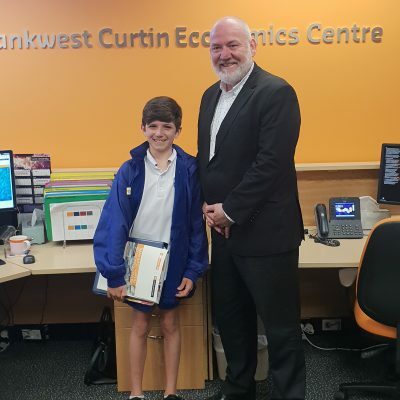 Young, ambitious and motivated, the Cottesloe Primary School graduate wanted to find out more about Professor Duncan’s research findings and the related policy implications to help with a school assignment. The two met over Milo and muffins at the Centre in November. During his last two years of primary school Christopher participated in the Department of Education’s Primary Extension and Challenge (PEAC) program, offered to gifted and talented students in years 5 and 6. For four hours each week, PEAC students undertake up to six consecutive short courses, from a broad and challenging selection of topics. It was during his research for the PEAC Parliamentarians course that Christopher discovered Professor Duncan’s research on child poverty. As part of the course, each student had to prepare a five-minute speech on a subject or issue of their choice, and deliver it in the Legislative Council before an audience of politicians, teachers, students and parents. Christopher identified his topic of ‘Child Poverty in Western Australia’, following a comment made during an interview with Dr David Honey MLA, Member for Cottesloe. His well-researched presentation included references to Dr Honey; Mr Colin Pettit, Commissioner for Children and Young People; and Professor Duncan. “I ask you, honourable guests, parents, teachers, ladies and gentlemen, to think about that for just a moment. No breakfast, lunch or dinner. “And in a place just streets away from where I live and go to school. “When I thought about this, and after doing some research, I kept seeing the words ‘child poverty’. To top off his excellent result in his PEAC course, Christopher received a Woodside SciTech Science Award at his school graduation in 2018. The award recognises outstanding results in science by students throughout West Australian primary schools. Professor Duncan said he is tremendously proud of Christopher’s passion and academic achievements. “I am especially proud that Christopher is highlighting the role of education in promoting or reducing inequality and child poverty,” Professor Duncan said. As for Christopher, he said Professor Duncan was the perfect mentor to assist him with his speech.